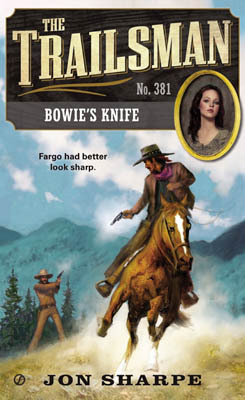 There’s no one who hasn’t heard of Jim Bowie and his legendary knife. And Skye Fargo’s been hired to guide a brother and sister to the border to purchase the actual pig sticker handled by Bowie himself. But there are others after the blade. And the Trailsman will have to be a cut above the competition if anyone’s going to survive. So just how much is Bowie’s knife worth in dollars and lives? Seems like Fargo will find out if the knife is authentic…but how do you prove this? And who is behind the attempts on the Caventry’s lives? Plenty of questions to grab hold of the reader’s curiosity, ensuring that this book is a very hard to put down read. The owner of Bowie’s knife proves to be a worthy adversary in negotiations and has some strange tastes in life’s luxuries, and with a nickname of ‘The Throat Slitter’ you just know The Trailsman is going to be in deep trouble very soon. The book is told in short chapters that mostly have cliff-hanger endings that urge you to keep reading. Filled with savage action and desperate characters that will stop at nothing to get what they want, and sharp dialogue that is often laced with humour that counterbalances the more brutal aspects of the tale, this is another Trailsman book that highlights why I keep reading this series every month. If you are a fan of the Trailsman series, David Robbins’ work (for it is he writing behind the pseudonym of Jon Sharpe this time around) or just superbly told westerns then make sure you don’t miss this. Nate King’s daughter is sixteen and in love. She conspires to trick her father and sneak away with the warrior who has claimed her heart. Only they don’t know that four killers are on the loose, slaughtering settlers and anyone else they come across. Now it’s a race against time as Nate tries to find his headstrong pride and joy before the killers do. At last, the return of the Wilderness series, something I, and many other fans, have been patiently waiting for. Now published by Mad Hornet Publishing and put out under the authors’ real name, David Robbins, instead of the pseudonym of David Thompson. Filled with excellent descriptive prose that puts you right into the wilderness, sharing the dangers of the wild, feeling the power of emotion through both fear and love, this book once more proves just why the series is held in such high regard by both male and female readers. Switching between the various groups of characters regularly means David Robbins often leaves them in cliff-hanger situations which urge the reader to keep turning the pages. Action scenes steal your breath and make you wonder just how they can escape alive, just witness Zach being trapped up a tree whilst a grizzly strives to make him its next meal to see what I mean. Through all the tense situations there is plenty of cracking dialogue, some of which made me laugh out-loud, mainly whilst Dega, the Indian Evelyn King is in love with, tries to make sense of the white man’s language he is struggling to learn. And what of the gift of the title? Sorry but I cannot reveal that here, other than say it will get you thinking. Once again David Robbins doesn’t disappoint and strengthens my belief that this is one of the best western series being written today. Let’s just hope it isn’t too long before the next Wilderness book is released. The Gift is available as both an ebook and paper book through Amazon, and will be for sale through other book sellers soon. Paid to mind other folks’ business, Joshua Dillard did it with a .45 Colt Peacemaker. But he also had a mission of his own, and when Butch Simich and his bunch stuck up the stage from Tucson he swung into vengeful action. Stirring it along came Dorothy-May Pennydale, spirited daughter of a whiskey-soaked way station boss. And in the thick of it from the start was Clement P. Conway from New York City, hack writer of dime novels – a greenhorn with guts plunging out of his depth. The fight led into treacherous territory, up against rogue marshal Virgil Lyons and saloonkeeper Dice Sanders, whose greed for women and money produced mayhem ... and the most violent gun battle the one-horse town of Hellyer’s Creek had ever seen! 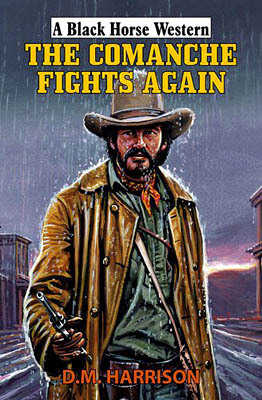 Chap O’Keefe has assembled a terrific set of characters for this Joshua Dillard novel that begins with a stagecoach robbery and then never lets up with action until the end, which includes an excellent fight between two women. Dillard isn’t above making mistakes, and after being captured by the stage robbers he’s left in a how’s he going to get out of that situation that will keep any reader turning the pages to discover the answer. It’s assumed that Dillard is working for Wells Fargo throughout the story and this fact makes for a neat twist ending that also leads to a humorous reason for Dillard to ride on to his next adventure. 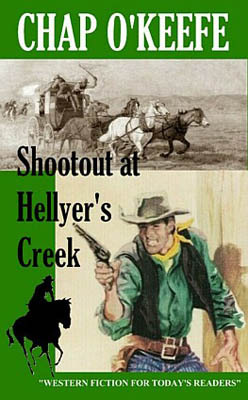 Shootout at Hellyer’s Creek should appeal to all those who enjoy traditional westerns filled with non-stop action, and at just under $3.00 / £2.00 how can you afford not to give this a try? 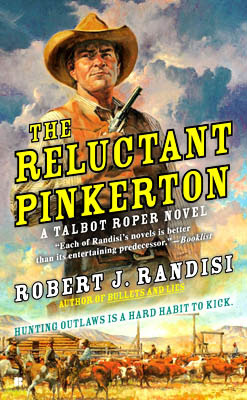 Former Pinkerton agent Talbot Roper has a begrudging respect for his old boss. When Allan Pinkerton dies and his sons send for Roper to attend the funeral, he has no choice but to oblige them. But Pinkerton’s sons, who now run the agency, want Roper to do more than pay his respects. They have a dangerous assignment that no man on their payroll can handle. Now Roper is headed for Fort Worth, Texas, where someone is sabotaging the Union Stockyard company. Undercover to infiltrate the industry, Roper knows that the men he’s up against aren’t just smart; they’re deadly. And he’ll need to remember everything Allan ever taught him to finish the job…and stay alive. Robert J. Randisi has written hundreds of westerns and crime novels and in this series he combines the best of both worlds to create a fast moving, gripping, read that is very difficult to put down before you find out who is behind the stockyard sabotage and why they are doing it. Roper is an engaging hero and I particularly liked how he decides to go under cover, dressing differently and using a new name, yet doesn’t quite get it right meaning those he’s trying to deceive sense something is wrong about him and with each new character Robert J. Randisi introduces, Roper finds his list of suspects getting longer and longer. Roper also has to deal with Dol, a young lady who wants to be an operative Pinkerton, to show that women can more than match the male detectives in ability to solve a crime. Roper just sees her inexperience as a hindrance that could get them both killed. Can Dol prove herself to both him and the Pinkerton brothers? 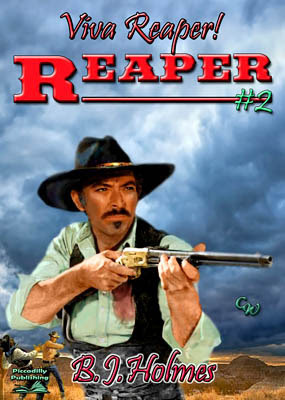 Some will know that many of Robert J. Randisi’s westerns contain explicit sexual content, so I feel I must point out that the Talbot Roper series is not one of those. What it does have is plenty of tense scenes, lightning fast action, and many twists and turns, resulting in a book that should appeal to all who enjoy well written westerns, particularly those who like plots containing mystery elements. Let’s hope it’s not too long before Talbot Roper hits the trail again. The normal run of things was for bounty hunter Jonathan Grimm to do the chasing, but when he found it was his turn to get out of town, the trail stretched all the way to Mexico. When he rode in, saddle-sore and stuck with the problem of trying to nail a hard case with no face, the small border town beyond the Rio Grande already seethed with tension. Framing him for murder just set the scene for more shooting. Only one thing was for sure; where he went, death followed. That’s why they called him the Reaper. Originally published in 1996 this is chronologically the second Reaper tale, and certain events from the first book, Comes the Reaper, still trouble Grimm and pose a threat to his life – you don’t need to have read that first story though as B.J. Holmes includes just enough information in this one to explain events leading to this. Grimm’s determination to make some money out of bounty hunting seems to be thwarted at every turn, yes he gets his man but then things turn against him and his expected payday just doesn’t happen the way it should. This is why Grimm finds himself hunting a faceless man. There’s plenty of action as Grimm finds himself framed for murder, double-crossed and involved in an assassination attempt. It also seems none of the people he deals with can be trusted. All this will have you wondering if Grimm will make any money out of this quest or even escape with his life. After finishing this I found myself hoping it won’t be too long before Piccadilly Publishing makes the next Reaper book available. Mitch Bayfield, or Broke as he prefers, is kidnapped and raised as a Comanche. When, many years later, he looks for his kin he finds himself unable to settle in either world and turns his back on them all. Because a young white girl who still lives with the Comanche band is still there, he is determined to back for her. After a bloody confrontation with the Comanche warriors, Broke and Little Bluestem are allowed to flee. But it’s just a game. And they know that capture means torture and death…. This is the second book about Broke and D.M. 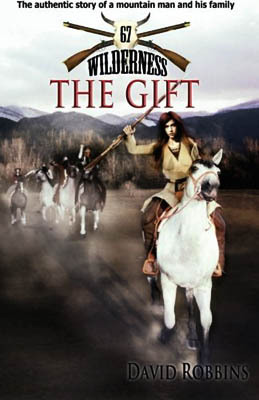 Harrison includes enough background in this to fill in the backstory of not just Broke but the other characters that return too, and of the relationships that they have with other, such as the now deadly animosities directed at Broke by his Comanche brothers, Black Horse and Wolf Slayer. Once on the run from the Comanches Broke also has to deal with a gang of bank robbers and being hunted by a Cavalry patrol, this latter band is an unknown threat for much of the fast moving story. D.M. Harrison sticks mainly with Broke but does switch to other characters every now and again which soon had me wondering how Broke and Bluestem would survive once the various protagonists came together. And most do meet up in the violent clash between Colonel Mackenzie’s troops and a mixed group of Comanche, Cheyenne and Kiowa at Palo Duro Canyon. A real life battle that took place in 1874. Having read this story I find myself wanting to dig out the pervious book, The Comanche’s Revenge, and looking forward to the third in the series which Diana has told me she is currently planning. 1886. Geronimo and his followers, the last Apache resistance to white encroachment, have been transported east, and the blue wool defenders of The Fort settle into boredom, directing their cruel attentions to illicit liquor and prostitutes, their clearest enemy a weak officer’s bullheaded wife on a moral crusade. One broken and battered Chiricahua boy, Na-e-te-nay, drags himself across the Arizona desert, held together only by a bleak vision of revenge; a vision that will cause him to abandon his warrior traditions and set his feet on Coyote’s Trail — the road of murder and evil. After a brothel shootout between Na-e-te-nay and the US cavalry ends in fire and death, America, a broken young Mexican woman with her own reasons for hating the cavalry, finds herself pulled into his plot. 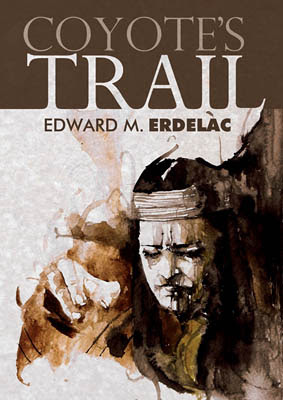 Ever since reading Edward M. Erdelac’s previous western, Buff Tea, I’ve been looking forward to his next, and at last it’s here, and what a superb novel it’s turned out to be. The three main characters are each fascinating in their own rights, each having their own personalities and agendas, each ready to work with and/or use the others to achieve their aims. Edward M. Erdelac’s west is a harsh place where savage violence is only a heartbeat away. He tells his tale in vivid prose that paints dramatic and lasting imagery within the minds’ eye. You can almost taste the dirt and blood, feel the heat and share the anguish and pain as Na-e-te-nay and America struggle to avenge the wrongs done to them. Coyote’s Trail is a tough, and brutal, story that grabbed my attention from the first page and refused to loosen its grip even after I’d reached the end. The final scene is moving and will stay in my memory for a very long time. Edward M. Erdelac has written what could well be my western of the year!